I was born at the end of the year 1976, in Dundee, Scotland, and lived in a small cottage with a fat black cat and two parents, neither of whom were fat or black. Or cats. We lived in Letham, and moved to the big city a few years later, because the big city had a school, and not just a newsagents and a road, like Letham did. This picture was taken on my very, very first day… at the bank, apparently. Things were different in those days, and tiny Scottish boys were politely requested to dress like little gentlemen. In that envelope is my RSVP to the Mayor’s Ball. I mainly hang around with another little gentleman, called Chris. The Fall Guy. The A-Team. Fraggle Rock. The Muppets. Superman. Spiderman. Action Men. Smurfs. Stephen King. We moved to Loughborough, the only place any self-respecting Smurf fan would go. Saturdays involved Woolworths Pick ‘n’ Mix followed by a burger next to some pensioners in the Wimpy. McDonald’s opened soon after. It was like Jesus himself had chosen Loughborough for his second, McNugget-based coming. Even Moscow got one before we did. In my spare time, I listen to an old cassette someone’s given me of something called Fawlty Towers, and I read PG Wodehouse and Adrian Mole books from cover to cover, and I hang around with a Fijian named Cameron. In a shock move, we leave Loughborough for Berlin. I attend an American school, which makes me think I am like something out of Degrassi Junior High. I buy a baseball cap. Later, I learn on the grapevine we will return not to Loughborough, but to Bath instead. It is now I suspect my father is in the witness protection programme. In my spare time, I listen to an old cassette someone’s given me of someone called Tom Lehrer. Before leaving for Bath, I notice my neighbour, Ian Fletcher, has bought a Sega MegaDrive. We play Golden Axe. It is good, but I have no time for such childish games. I have poetry to write. Soon after, I manage to save up enough for a MegaDrive. In my spare time, I listen to an old cassette someone’s given me of someone called Victor Borge. I own a Sega MegaDrive thanks to a thousand years of delivering the Bath Daily Star up huge hills and to the homes of people who really do not want copies of the Bath Daily Star. I now own Golden Axe too. It is ace. One day, I have a headache, and read a copy of Sega Power magazine, which I have bought with the £2 a week pocket money I get in addition to the £6 I receive for five hours of newspaper delivery. I realise it is published in Bath. Where I live. In my spare time, I watch and rewatch episodes of a brand new television programme called Have I Got News For You. I have managed to convince the editor of Sega Power, Andy Smith, to allow me to come in and undertake work that does not need undertaking. I alphabetize things that do not need alphabetizing. I make tea for people who already have one. I fetch the editor cans of Tango. I am asked to come back. I do, and one day a games reviewer gets ill. I am given my chance to review a game. I stay up all night and play it to death. The next day, Andy calls me into a nearby conference room. I assume I am to be sacked. I am asked if I want a job. I say Yes. I now work for Sega Power magazine and life is perfect. In my spare time, I listen to an old cassette someone’s given me of something called On The Hour. I continue playing games and doing my GCSEs and A-Levels. I start working for other games mags, like GamesMaster and SuperPlay. I take a year out, and am offered the Staff Writer job on TOTAL! Magazine. I take it. We have fun, and we laugh every day, and life is good. But an idea some friends have had has started to gain interest. A comedy magazine, which we decide should be called Comedy Review. I will be able to stop writing about games, and instead write about Tom Lehrer, and On The Hour, and Victor Borge. Hurrah! We launch it and it folds five months later. I go to the Edinburgh Festival, where I hang out with my new pal Ross Noble and work as a reviewer and interviewer for The Scotsman and The List. I am amazed by its wonder. I leave Bath for London, where I’ve found a university course that will teach me how to make programmes and turn ideas I’ve had into something more solid. I attend Westminster University and do the Media Studies Course, which turns out to have been the best decision I could ever have made. I opt for Advanced Radio, and am taught by some of the best people the industry has to offer… people from Radio 1, and Radio 4, and even John Tydeman, who I’d read about as a kid in the Adrian Mole books. I start freelancing for the likes of Melody Maker, and am asked to go to Edinburgh again, this time as a judge on the Perrier Awards panel. I say yes. I launch an underground magazine at university with some friends and get into trouble. Inexplicably, I am now hanging out almost exclusively with Norwegians. I begin to think about jobs, and apply for a BBC trainee producership… in radio comedy. The same place that made On The Hour. It would be a dream come true. I meet a man named John Pidgeon while on the Perrier Panel, and realise he’s the guy I’ve applied for a job with. I avoid him for the rest of the festival in case he thinks I’m some kind of stalker, but one night he phones me and says he’s just read my application. Nothing more is said until my interview. I am offered the job and am thrilled. I start as a trainee producer at the BBC. Immediately, I get to work. I am told to shadow a brand new Radio 4 show called Dead Ringers. It is quite fun. I get to make suggestions in edits or make up the phone numbers for the live prank calls. I mainly call my friends’ parents, without their knowledge. Many of them are on the CDs now. I come up with an idea which I ask Ross Noble if he’d like to be involved with. He says Yes and I pitch it. We’re sent to Poland to make it. Radio 4 don’t commission it. And then they do. So we plan trips to Shanghai, Belgium, Singapore, and other comedy hotspots. I also start working with Dave Gorman, my then flatmate. We get into an adventure which spirals into something else. We begin to write it as a show, then the following year take it to Edinburgh, where it grows into something bigger and is nominated for an award. We produce it for television. I really want to work with The Mighty Boosh, who I’ve known a couple of years, and together with John Pidgeon we hatch a plan to get them on the air. Radio 4 tell us they do not want The Boosh and will not commission it. So John finds some money under a sandwich on his desk and we make it anyway, in a disused disco in Shoreditch, sometimes in a studio that doubled as a men’s toilet. Radio 4 hear it and immediately want it. We are proud. 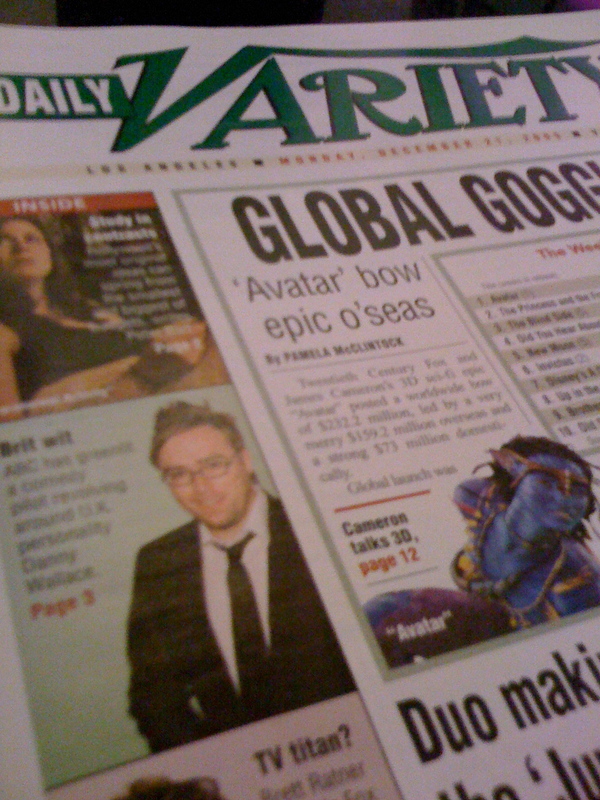 The press love it, and it wins an award. I finish my work on the DG book and hand it in. I catch SARS while in China with Ross Noble. I accidentally start a cult. I have fallen slightly out-of-love with working in an office and leave the BBC. While I’m working out what to do next, I inadvertently garner a worldwide following of kind-hearted people, eager to do my bidding. Join Me is born. It spreads to all nations. I write the book and undertake a 30-date tour of America – from New York to Chicago to Milwaukee to Seattle to Los Angeles to San Francisco and back again – talking of my important wisdom and philosophies. We make a second series of Ross’s show. Join Me is published and the film rights go to a great British company. This is thrilling, and I begin to work with a man named Frank Cottrell Boyce – a film genius – on an adaptation he’s writing. But after an incredible year of travel, adventure, people, and fun, I realise what I am left with… a whole new year to fill. I am overwhelmed, slightly, and stay in more, watching television and ordering curries. I say No to life. And so I start to say Yes more. Yes to spam e-mail. Yes to a request from Richard & Judy. Yes to everything. How To Start Your Own Country is not commissioned by BBC2. And then it is. I declare my one-bedroom flat in Bow an independent state and myself a King. This feels good. I travel the world meeting fellow royalty and looking important. The show wins two BAFTAs, and an almost-too-loyal fanbase, several of whom take against me when I am unable to dedicate my entire life to running a small country from my flat. Yes Man is published in the UK and the US. The film rights go to Warner Bros. I am flown about for meetings and have posh lunches but it never feels quite real. I also get my first live gig on a Saturday night show on BBC1, with Davina McCall. The show is bashed, but it was fun, and fun’s all I’m after. I make a pilot for a BBC1 show called School’s Out. It does not get commissioned. And then it does. While walking around Habitat looking at desk lamps I am phoned up and asked if I want to replace Phillip Schofield on Test the Nation – I say ‘Okay then!’. But I realise I am getting closer to 30, and this worries me. After all, I’ve just been walking around Habitat looking at desk lamps. I find an old address book in which is written the names of 12 of my best mates from growing up. Like Fijian Cameron. And little gentleman Chris. Where are they now? I decide to find out. I am asked if I’d like to make a science programme for Horizon. I’ll be the first person to present it in 43 years. 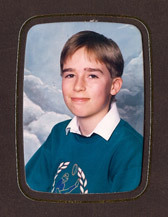 This angers the scientists of the world, who decide that they’d be better at it, but it makes my mum proud. A video I write and present with Dan Tetsell wins a couple of awards at the New York Film Festival, and a second series of School’s Out is commissioned, this time for Saturday nights. I attempt to take up badminton, but fail. Jim Carrey says he’d like to be in Yes Man. It’s become entirely real. I fly out to LA for more posh lunches and feel excited. We record the second series of School’s Out and the next day I leave for New Zealand to host 1000 episodes of Castaway – the BBC’s original reality show, reimagined. It is grueling work but fun, and I get to live on a proper desert island, which the Daily Mail decides is a luxury resort – until they get there and realise it doesn’t even have proper roads. The show is bashed and moved around the schedules but the viewing figures fine and the experience precious. I get home and do another Test the Nation and then write Friends Like These in my garden with a sandwich. I start writing a weekly column for a new magazine called ShortList, and a photograph I take of a clothes peg is displayed in the ICA. Friends Like These is published, and I start a weekly radio show in the old Ricky Gervais slot on XFM and drag my friend Rich Glover in to do it with me. We have a lot of fun, and our podcast goes to number 5 in the overall charts, which irks Andrew Collins. My column is highly commended at the PPA Awards, and I go on Friday Night With Jonathan Ross to promote the book, where Sienna Miller touches my knee. I do a series of bizarre chat shows around the world. I spend some time in LA on the set of Yes Man, where I’ve been given the role of Associate Producer, which is a bit like being in charge of the pencils in an office. I get a chair with my name on and a trailer, though. I walk around, pretending I am a Hollywood mogul, but looking more like a Hollyoaks one. I make another Horizon, which angers the scientists of the world, who decide that they’d be better at it, but it makes my mum proud again. 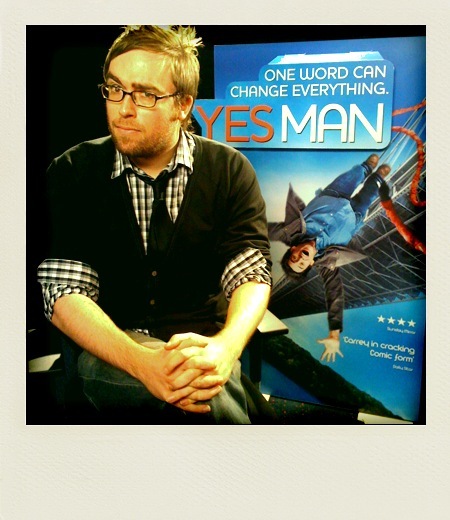 The World Premiere of Yes Man takes place in London, and I invite my friends. Fijian Cameron turns up. Little gent Chris can’t make it, but sends his love. I parade about with Jim Carrey, and then fly to LA for the next one. Join Me is eight years old, and still going strong. I am proud. The film rights to Friends Like These go to Miramax, who begin to put the whole thing together. Yes Man comes out on DVD, and Friends Like These in paperback. I record a pilot for BBC Radio 4, based on an idea I had called New World Order. It feels like a hit! I am happy. I inadvertantly see an email from the head of commissioning saying she’s listened to 12 minutes and shan’t be listening to any more. I sigh, heavily, and shake my head a bit. I’m asked to judge on the Sony Radio Awards, and also the Royal Society Science Book of the Year – I think largely because I wear glasses. I start presenting on BBC 6Music, which is an unfettered joy, and then I present an award at the Videogames BAFTAs, and I can’t help but wonder if Andy Smith is out there somewhere. He still owes me 50p for that Tango. That night, I’m approached by a lovely, friendly man, who offers me a part in a videogame. I say yes. It turns out to be Assassin’s Creed 2. I say yes again, louder this time. The year ends with a bang. The meeting in LA led to a script commission which leads to the first pilot pick-up of the American TV season. ABC want to make a sitcom out of my next book, Awkward Situations for Men – a compilation of my ShortList columns. And then… I become a dad. The year starts with a show on Radio 2 and hosting the backstage show at the National Television Awards. Plus a lot of sleepless nights. I begin work on a novel, which feels weird, and I take over the Adam & Joe Show on 6Music when they announce their hiatus, though I soon have to quit, so I can fly to LA to finish casting the sitcom. And I realise I should probably learn how to act, myself. We shoot the show, which is directed by Andy Ackerman and co-stars Tony Hale from Arrested Development and Laura Prepon from That 70s Show and then we fly to San Francisco to shoot the title sequence. 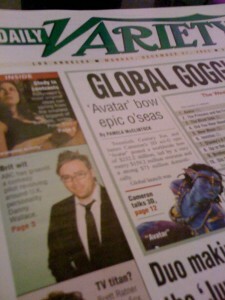 I have incredible fun, but work incessantly, and get the hang of living in LA. I also get the hang of being a dad, which it soon becomes clear is the only job I need. The show gets down to the final, final shortlist at ABC, but they decide they want it to be a show shot in front of an audience, like Cheers, or Seinfeld. And we hadn’t done that. So they commission another script and we set to work. Back home, Awkward Situations for Men is released, and goes to number 3 in the Sunday Times bestsellers lists. I’m thrilled, then drive into town and record a load of new stuff for Assassin’s Creed Brotherhood. I decide to spend the rest of the year writing. So I do. I decide that 2011 will be a year for me to try some different things and flex some different muscles. So I finish writing my first novel: Charlotte Street. Exciting things begin to happen, even though it’s not out until May 2012. I’m commissioned to write a script for Channel 4, which I do, and though it goes down very well, it’s not the kind of thing they’re looking for. Ah well. I present an award at the games BAFTAs, the backstage coverage of the National Movie Awards, and I record some more voice stuff for the new Assassin’s Creed game – Revelations. And then I do the new stuff. 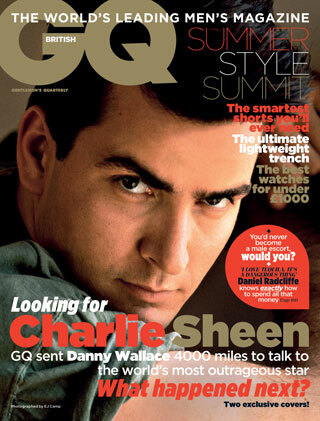 I’m asked to be a Contributing Editor at British GQ in features, and immediately fly off to Texas on the trail of Charlie Sheen. The story becomes the cover feature, which is quite a thrill and an ambition realised. I make a pilot for a late night Radio 2 show called What You Talkin’ About, Wallace? I love it, and the online reaction is amazing, but Radio 2 don’t quite know what it is or how to make it fit so don’t commission it. It’s a shame, but again: ah well. More Awkward Situations for Men is released in the summer, and I go off on a short booktour again, which is great fun – particularly because we have developed an iPad app that will make every bookreading different. 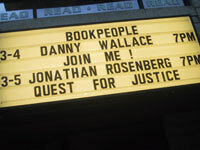 It’s the world’s first interactive randomised booktour. I imagine. We record some of the readings and put Wallace’s Wheel of Awkwardness on this very website. I’m properly thrilled to win the PPA’s Columnist of the Year Award 2011 and soon after will have written my 200th weekly column for the brilliant ShortList magazine. In July, it’s announced that from August I’ll be the new host of the Xfm Breakfast Show, and will present a daily show from London’s Leicester Square every weekday from 6.30 until 10am… it’s quite a lifestyle change, but it does two great things: 1. hosting a breakfast show is something I’d always wanted to do, but the chance very very rarely comes along. And 2. It’s doing something completely different. The show goes well. And in our fifth month we attempt a world first (well… since the 40s…). A 100% Live show. No records, no pre-recorded segments, no buttons. Live music instead of records, live guests, live jingles, live music beds and even live adverts, all live from the legendary Shepherd’s Bush Empire, and all in aid of WarChild. The line-up is great: Stereophonics as my house band, Paul Weller, Tim Minchin, Miles Kane, Tim Wheeler & Emmy the Great, Ross Noble and Smith & Burrows. It’s ace fun. Join Me turns 10, and Karmageddon 10 takes place in London, this time in aid of Build Africa. We raise thousands, and I look around the room to see so many familiar faces and friends. It’s a fine way to end the year. I try and only do things I want in 2012. I focus on the show, and while the hours are punishing, we have a great time – we win the Loaded LAFTA for Funniest Radio Show, we are the most-awarded show at the Sony Radio Academy Awards with a Gold, a Silver and a Bronze, and I win the Arqiva for Radio Presenter of the Year. And some stuff at Cannes. Charlotte Street, my first novel – becomes a bestseller and also becomes the third highest-selling debut novel of the year. It’s translated into 18 languages and becomes Italy’s #1 ebook and a bestseller in Estonia. That’s correct: Estonia. I file some more pieces for GQ – I fly to New York to interview the Dice Man and I try and harness Ian Fleming while staying at Goldeneye in Jamaica. I’m asked to host Loose Ends while Clive Anderson’s away, and I’m more nervous about this than anything I’ve done in years, then I get an email from a man named Mike saying he’s working on a videogame and would I take a look. It’s called ‘Thomas Was Alone’. At the same time, I reprise my role as Shaun Hastings in Assassin’s Creed 3 and they ask me if I’d like to write some stuff for the game this year. So I do, and I manage to give words like ‘ninnyhammer’ a wider global audience. The year begins with a Radio 4 documentary about the Beano – plus I get to write my own Dennis the Menace story and see it published, which is a proper childhood ambition realised. Plus, as part of the writing team on Assassin’s Creed I get a lovely email saying we’ve been nominated for a Writers Guild of America award. 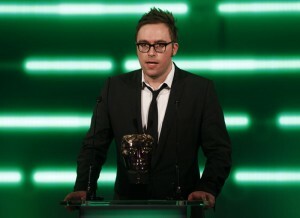 Also in video games, I win the BAFTA for Best Performer, for Thomas Was Alone. The pub quiz me and Dave blathered our way through, unsure if anyone was listening or not, wins a Silver Sony at the Radio Academy Awards.